Catch a criminal as you go deep undercover as the owner of a beautiful beach business in Summer Rush! With the majestic sea just feet away, and the sun shining down on you, it’s up to you to tackle tasks and track down a dangerous crook. Use your Time Management talents to gain the trust of everyone on the island and piece together the clues! Your job is simple, transport passengers around realistic cityscapes and country sides following a planned route according to a timetable and learn the basics of professional driving by obeying traffic rules and taking care of your passengers. Earn points to work your way from a simple city bus to a school bus, double-decker tour bus or even a prison transport in Bus Driver, a fun Simulation game! Build your very own medieval kingdom and protect your people, explore, trade, gather resources, learn magic and spells in King's Legacy, a fun Simulation game. After the fair king passes away, a new prince must step up and bring prosperity to his kingdom. Take the throne and fulfill your destiny! Defeat the incoming threats and keep your citizens safe from storms, ghosts, and more in King’s Legacy! Kate Summers is a busy real-estate executive from New York on vacation from the daily grind, and the beach resort she is visiting turns out to be a total mess! Help Kate turn around a failing resort into a tropical paradise! Use your Time Management skills to build accommodations and sightseeing attractions, manage the resort’s cash flow, and upgrade natural attractions such as hot springs and a volcano. When a band of merry sailors is cast up on the shores of a beautiful island, they find themselves in need of shelter and sustenance. Explore your new home, build mills and quarries, engage in trade and purchase upgrades to help these courageous settlers make ends meet in Island Realms, a fantastic Time Management game! Protect your people from bad guys and get creative as you help build a gorgeous island paradise! Tropical Dream: Underwater Odyssey is an inspiring story about a girl named Megan who wants to change her life. She’s had enough of living in a busy metropolis and decides to buy an old house on a Tropical Island. Well, nothing in life ever goes as planned; the house she just bought has seen better days. But just when Megan is about to give up, she gets an idea that will change her life: underwater pictures! Help Megan dive into the tropical waters and make her dream come true! The Empire State Building is now more exciting than ever! Participate in the construction of the iconic Empire State Building while learning tons of anecdotes. Become the construction site manager of one of the world's most famous monuments. Clear the site, produce materials, and hold back the creditors and the King-Kong fans. Don't abuse the film crew too much, though, or they'll put you even further behind! MONUMENT BUILDERS, the monumental time-management series! Build the city of your dreams- a residential paradise or an industrial center in Virtual City, a fun and exciting Simulation game! Construct gorgeous houses and industrial buildings as you produce goods and deliver them to the shopping malls. Make the city a cleaner place by recycling garbage, adding hospitals and fire stations, and upgrading building. 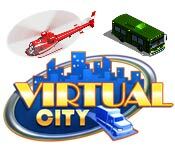 Deal with economic downturn and natural disasters in Virtual City! Carve a path through an unforgiving wilderness to rescue a hero trapped by a villain! As you balance time and resources, you'll also invent clever machines to accomplish special tasks, make friends with a Yeti, and prepare for the impending showdown against your enemy. Finders will provide hours of unforgettable fun! Save your aunt's struggling ski resort from foreclosure by turning a few rickety cabins into a booming getaway complete with ritzy hotels, classy shops and five-star restaurants. Along the way, keep an eye on your bottom line as you purchase supplies, hire and train workers, and acquire land in Ski Resort Mogul! Use your Time Management talents to make money, and upgrade the resort and save the day! Farm Girl is well known for her green thumb. Everything she plants on her farm grows and thrives but now there is a new challenge: Building a farm along the Nile! Establish a farm at the edge of the pyramids! New conditions require completely new management on the farm under the Egyptian sun. You need to adept your manufacture and your offerings to the current marketing situation – how about growing papyrus or an ostrich farm? Sandstorms, water shortages or annoying crocodiles shouldn't prevent you from building up a premier agricultural operation in Farm Girl at the Nile! In Coconut Queen, the island of Lui Lui beckons you to bask amid miles of sun-drenched coastline. Disembark into its beautiful floral air, and discover that you are the island's much-awaited legendary Coconut Queen! Your own private getaway is devoid of females, so find company among the brawny native gents, who welcome you with incredible gifts, and use your Time Management skills to improve the island! Farm for your Life in this zombie flavored farming game! After a heavy storm raises the dead, it's the task of the living to rebuild a sustainable life. Cultivate your farm, trade resources and manage your restaurant all while fending off roaming zombies in this uniquely well-designed game! Be Lynette's guiding hand as she creates a hotel empire in the heart of Las Vegas, complete with five-star accommodations, restaurants, casinos, and more! Buy low and then sell high in a winner-takes-all competition for land, money, and bragging rights. Outsmart the competition as you acquire new properties, purchase supplies, and hire workers. Upgrade your holdings until the city shines like the diamond in the desert it was meant to be in Hotel Mogul: Las Vegas! The bayou. The roaring 1920's. A supernatural secret. Step into Dark Manor, where ghostly hosts will help you find your way! Beautify your manor and explore the spine-chilling hidden object scenes... if you DARE! Brought to you by Big Fish Games, the #1 publisher of Hidden Object games!